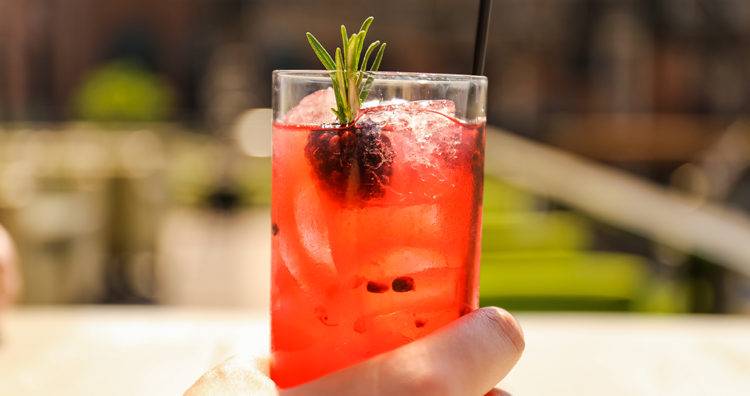 When the weather heats up in Ann Arbor, our usual craving for local food, Michigan beer and artisan cocktails combines with our need for summer sunshine. The ideal places to satisfy that desire include garden patios, beer gardens, and patios bathed in cozy string lights or shaded by trees along Main Street. If you feel the same way, then you’ve come to the right place. 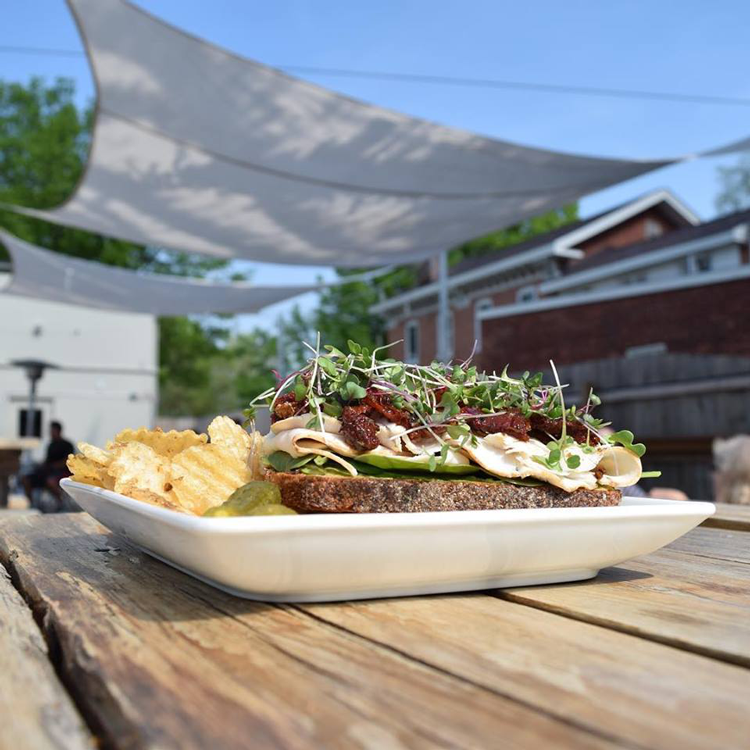 We rounded up a few of the best outdoor patios in Ann Arbor and Ypsilanti which happen to come with some of the region’s best local food, craft beer and artisan cocktails, too! Open seasonally March through October, Bill’s Beer Garden is a community gathering place offering an impressive lineup of Michigan craft beers and wines. 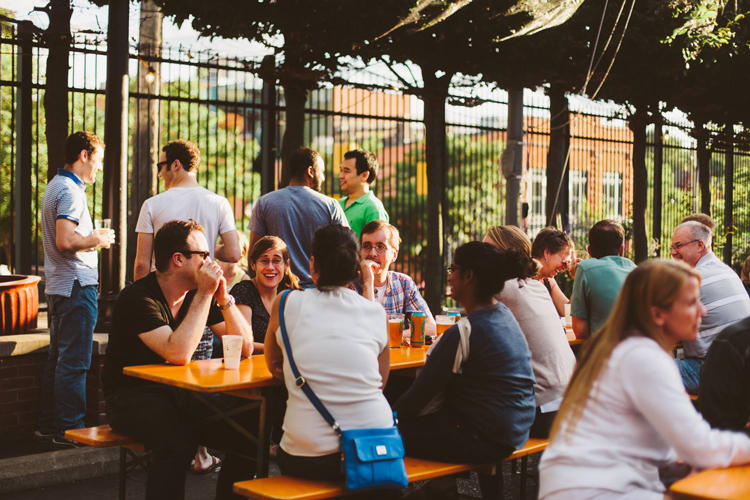 Located right next door to Downtown Home & Garden, the outdoor beer garden has long, communal tables, shaded areas, and frequent live music performances. Follow the team on Facebook for updates on weather closures and events. Ann Arbor Beer Grotto is famous amongst locals for its friendly atmosphere and destination patio. Attractions include frequent live music, covered spaces, charming string lights at night, 36 beers on tap, and a specialty cocktail list which features a rotating Frozen Sour Beer Slushy. Stop by on Monday night for Free Pizza Monday to enjoy free Domino’s Pizza with your beer! This coffee bar and tap house is a Ypsi favorite. Built around the mantra, “craft, community and cause,” you’ll find the best craft coffee and beer, regular community events, and support of worthy causes. Their sunny, dog-friendly beer garden is one of the largest in the area and offers the perfect place to gather with friends, family and neighbors. 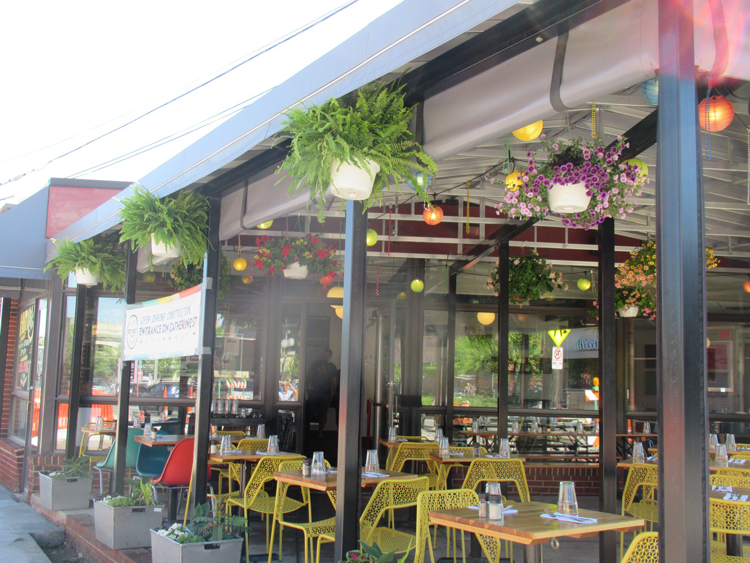 Dominick’s is famous for their potent sangria, their Italian-inspired eats and, of course, their patio! Since opening in 1960, this locally-owned spot has been the go-to for locals, students, families, you name it! Swing by the patio on a sunny summer day and you’ll quickly find out why. From the team behind The Lunch Room, Detroit Street Filling Station is another delicious food and drink establishment in Kerrytown. Tucked inside one of Ann Arbor’s most recognizable historic buildings, the interior space merges filling station history with modern updates — and it includes a covered outdoor patio surrounded by beautiful planters! In addition to a welcoming indoor space and 70 beers on tap, The Session Room is also home to one of Ann Arbor’s best beer gardens. Shaded by umbrellas during the day and illuminated by string lights at night, you can enjoy your craft beer and upscale eats outdoors all summer long. And don’t miss the Summer Beer Garden Music Series with 19 free shows through September! Get details on the weekly concert on The Session Room Facebook page. The culture of Italy comes alive at Palio. The authentic, country-style cuisine pairs with warm, rustic Italian decor inside. And during the summer, you can grab a seat on Ann Arbor’s largest and most popular outdoor gathering spot: the rooftop patio! It offers the best view of downtown and its own kitchen with a unique dining experience. 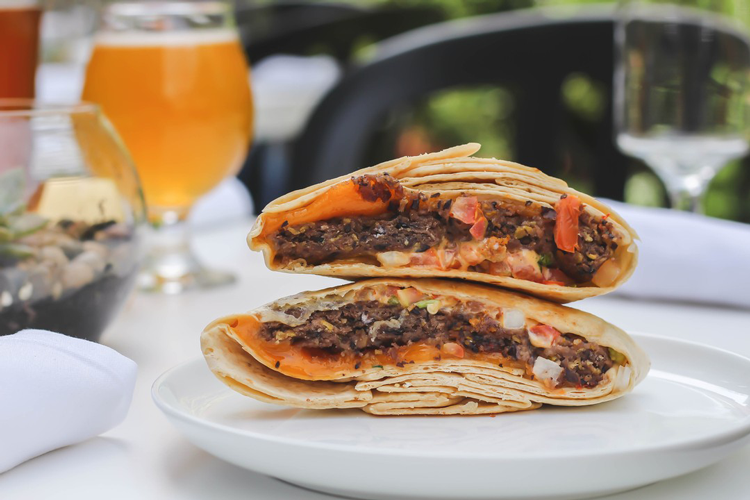 On the exterior of Sidetrack’s historic building, a gilded quote attributed to Benjamin Franklin reads “Beer is proof that God loves us and wants us to be happy.” And directly beneath that, you’ll find one of three great patios. With space for 150 guests, the outdoor spaces are complete with ivy-covered walls and plenty of sun while the enclosed patio offers shade and fresh air. Aventura is a charming spot that offers authentic Spanish cuisine and culture, including tapas, paella, vino and artisan cocktails. Inspired by the old-world atmosphere and the historical nature of the building itself, the eatery merges Ann Arbor history with modern Spanish influence. Facing Washington Street, their small collection of patio tables are ideal for sharing tapas and sipping cocktails under the sun. This sleek seafood restaurant offers a unique lounge atmosphere with cocktails, music and mouth-watering cuisine. And with its prime location in the heart of downtown Ann Arbor, you can grab a seat on one of the neighborhood’s largest outdoor patios. Complete with charming trees, string lights and artisan cocktails, the seating area is nestled between Main Street and the sidewalk in front of the restaurants so you can people watch, too! Located on the corner of Liberty and Main Street, The Pretzel Bell patios are located on the sidewalks along each street. Complete with shady lounges and couch seating, large tables and charming garden beds, it’s one of our favorite places to enjoy the restaurant’s mouth-watering foods, craft beer and artisan cocktails. 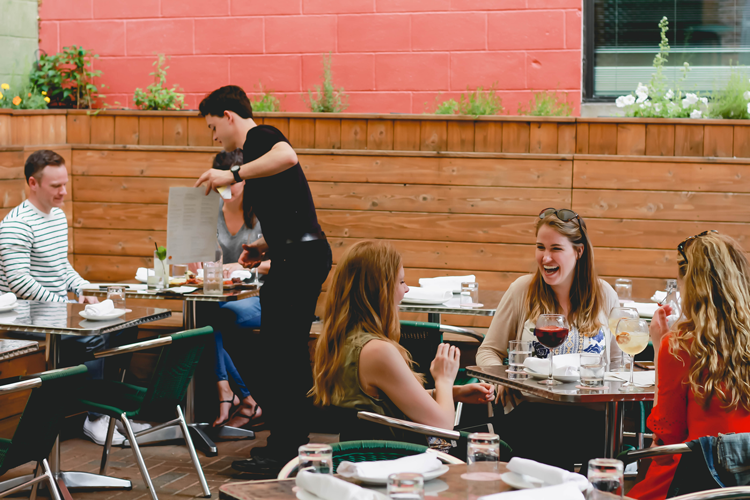 Inspired by the culture and cuisine of Italy, Paesano is one of Ann Arbor’s best local restaurants and they’re home to one of the most romantic garden patios, too. Tucked in a humble location along Washtenaw Avenue, the patio is hidden by shady trees, mature shrubs and beautiful garden beds. While you relax and savor your authentic Italian fare, you can also enjoy the sights and sounds of the patio fountain. Located at the corner of Main and Washington in the heart of downtown Ann Arbor, Felix has been a staple of fine dining in our community for more than 20 years. Their bistro-style patio is tucked beneath the shade trees of Main Street between two garden beds. There, you can sip craft cocktails, share small plates, enjoy brunch and relax. Sava’s began as a quaint, 23-seat cafe, a passion project of owner Sava Lelcaj. Today, it has become one of Ann Arbor’s best restaurants boasting upwards of 300 seats, a seasonal menu and impressive, artisan cocktails. And a few of our favorite seats are located on the patio. The outdoor dining area is perpendicular to State Street running along the side of the building and facing garden beds and the ivy-covered walls of U-M’s Lane Hall. Fenced off from the sidewalk and shaded by beautiful trees and garden beds, the Main Street patio at Gratzi is a must-visit. The building itself was once Ann Arbor’s Orpheum Theater which lends itself perfectly to the charm and character of a hometown, Italian restaurant. Whether you’re stopping by for dinner, drinks or weekend brunch, we definitely recommend grabbing a seat outside. Taking inspiration from real, historic pubs in Ireland, Conor O’Neill’s is the place to go for community fun, social gathering, Irish hospitality, hearty food and great drinks. Their seasonal patio is separated from sidewalk traffic along Main Street by flower beds painted in the same blue as the iconic storefront. With trees for shade and string lights during the night, you can sit and savor any time of day or night! If you have a favorite patio in the Ann Arbor area, let us know in the comments below!